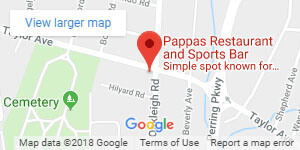 In 1972, the recipe for Pappas’ Famous Crab Cake was born, and for forty years, this secret recipe has remained unchanged and well guarded by the Pappas Family. You are about to enjoy the result, a true gem of Baltimore: the BEST crab cake in Maryland! The man responsible: Mark Pappas. Born in 1932 in Velvendos, a small yet proud town in Northern Greece, Mark Pappas learned quickly the value of hard work, humble service and personal integrity. In 1956, he came to the United States in search of the American Dream. With no money in his pocket and not understanding a word of English, Mr. Pappas settled in Baltimore with his uncle’s family and made a name for himself. By 1961, he’d learned English, became a proud citizen of this country, and saved enough money to buy the Mount Vernon Restaurant with a partner. Here, in downtown Baltimore, he developed a nose for seafood and a commonsense approach to customer service: give them delicious, high quality food for a fair price and they’ll come back. By the early 70’s, with a beautiful wife and three small children in tow, he was ready to set out on his own in Parkville, Baltimore County. He took over Wargo’s Western Steak House & Stag Bar, renamed it Pappas Restaurant & Sports Bar, and developed a diverse restaurant menu including a wide selection of steak, pasta, and fresh seafood entrees including his unique, seven-ounce heavenly crab cake. It wasn’t long before the word spread, and soon his customer base grew. In 2010, with his son Steve in command, Mr. Pappas branched out to Glen Burnie, Anne Arundel County. We are proud to continue the Pappas legacy and hope you enjoy your experience at our restaurant.